Week 1 was a complete let down in almost every aspect, unless you are a Chiefs fan, played Alex Smith in Daily, or drafted & started Kareem Hunt. The Packers/Seahawks game totaled just 26 points and while the Falcons/Bears game did give us Tarik Cohen and Austin Hooper's stiff arms, three quarters of that game was a boring 13-10. But that is what week 2 is for! The Packers and Falcons are ready to put points on the scoreboard and you need to take full advantage of this matchup. Rodgers is the 2nd most expensive QB this week on FanDuel, $100 behind Tom Brady. He did pass for 311 yards and found Jordy Nelson (who is by default in any stack with Rodgers) for a touchdown, but his adjusted yards per attempts ranked 15th, behind BLAKE BORTLES. Rodgers is about to go off on the Falcons secondary. Mike Glennon just completed 65% of his 40 attempts in week 1 and did not throw an interception. Glennon found success, like many QBs in recent memory, throwing to his running backs. That means you must play Ty Montgomery. With the three Packers in your lineup, we look to Falcons for a player to add as we expect both sides to put up plenty of points. We will be running Julio Jones in this lineup for obvious reasons. The Raiders defense is the 2nd most expensive team this week, behind the Seahawks. With those being two of our three favorite defenses this week, and our approach being save money on this position, we will play our favorite defense, the Cardinals @ Colts, at a $300/400 savings. There is a $700 difference between Justin Tucker and the bottom of the kickers list. Find yourself a kicker with a $4,700 price tag and move on. With a RB, WR & TE left, we have $5.9k per player. Since the TE position should cost us the least amount of money, lets go there. Martellus Bennett is the top priced TE under $6k, and if you want to go all in on this game, do it. Austin Hooper is an option as well at a $300 discount. But we will look elsewhere. Kyle Rudolph is the same price as Hooper and the Steelers will have to stop Stefon Diggs and Adam Thielen if they want to win, which could open up targets for Rudolph. Cleveland's Seth Devalve and David Njoku caught six of 7 targets for 62 yards last week against Pittsburgh. Now with $12,300 remaining for a RB and a WR, lets go save some money on our WR3 with Nelson/Jones already in our lineup. As we mentioned in our Patriots/Saints DraftKings Stack post, pick the Jaguars Allen Hurns/Marqise Lee at your own risk. John Brown ($5.8k) could be a nice GPP play this week after an ugly performance by the Cardinals offense against the Lions in week 1. Brown is battling a quad injury but he did see 9 targets last week and gets a terrible Colts defense this Sunday. Nice part is, if for whatever reason he does not play, Thielen is the same price and is a quick, safe swap despite his potential high ownership. 88 of Matt Ryan's 311 yards last week came via this nasty stiff arm by a wide open Austin Hooper. Film Session: @DjShockley3 breaks down how Austin Hooper got so wide open for the score. Swapping Rodgers/Montgomery for Ryan/Tevin Coleman, we will keep Julio/Jordy, Rudolph at TE, our $4,7k kicker and the Cardinals defense. That leaves us with $7k per player for a 2nd RB and 3rd WR. 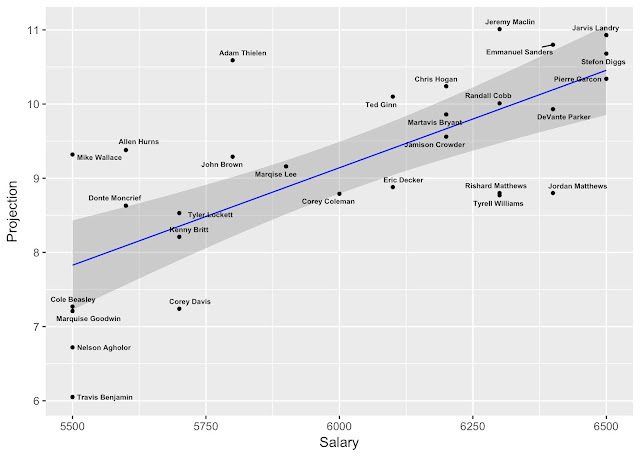 Essentially, we can pick any RB we want because we can spend less on a 3rd WR. Le'Veon Bell, at $9k, is the most expensive RB playing in week 2 but goes up against a stellar Vikings run defense. Ezekiel Elliott gets the Broncos defense and LeSean McCoy faces the Panthers. We wouldn't spend my money on any of those running backs. 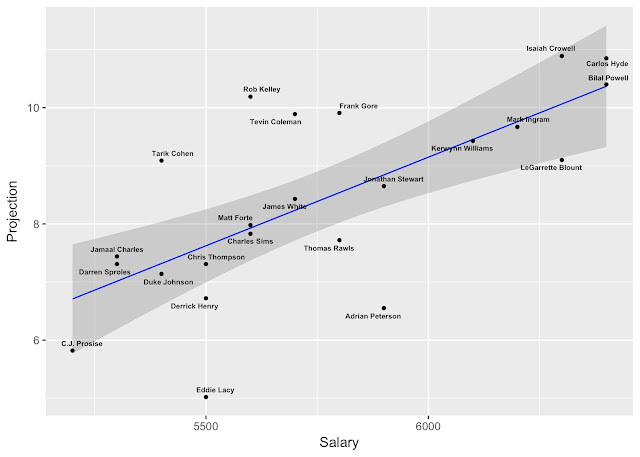 Melvin Gordon & Todd Gurley are our projections favorite RBs, priced between $7.5k-8k and are separated by $100. Pick your favorite!